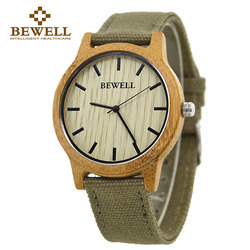 Home › Lover's Watches › BEWELL Bamboo Wood ..
2.Imported Japanese quartz movement:keep the time precise, it is accurate to within ±26 seconds per year. 3.Imported Japanese battery :endurance 24 months -36 months. 4.Daily life waterproof :not for showering, swimming and diving. 1.It is not as cold as steel watches, not so heavy, the most important thing is that you can treat it as a handicraft,you have a lot of choices,difference makes you more attractive. 2.The material is unique, so you can not find two identical watches, just as you can not find two pieces of the same leaves. 3.Very light so that you do not even feel you are wearing a watch. 1* Watch+ 1* Original Paper box+1* Tag+1*instruction book. If you want a pine box instead of the original Paper box,please Click. If you want a pine box instead of the original Paper box,please Click.it will cost $8.86. 1. Items will be shipped within 1-3 business days after we verify your payment. 2. Please tell me your current address after your payment within 1-2 days; otherwise, we will ship your item based on your address, so make sure it is correct. 3. The default choice of AliExpress Standard Shipping registered! Normally,15-60 days to reach the destination, different countries arrived at different times! 4. Sometimes it would be longer because of the bad weather, a waste of time in customs clearance. Thus please wait patiently when you do not receive your item on time. If you don't receive the item within 60 days, please contact us, and then we will help you track it. 5. In order to ensure you receive your goods tax free upon import, we will declare it as a lower value. This lower price does not reflect the total price you paid or the market value of the goods and may not apply to countries with different tariff rules. Any import charges or fees would be the buyer's responsibility. 1. We hope our products can always make you satisfied! 2. If there's anything wrong, please contact us at the first time, through online system or e-mail within 3 days after the arrival, better with pictures to show the problem clearly. 3. If you are not 100% satisfied with the quality of the goods and need to return or exchange, do it within 7 days after the arrival, and you are responsible for the delivery fee. 1. Your feedback is really important to us. Please take a few seconds to leave a great feedback if you are satisfied with our product and service, thank you! 2. We do try to respond as quickly as possible. but please allow to delay response for non-business time. We will be glad to answer any question. Have any questions feel free to contact me. Q: How much does it cost to ship to my country? Q: Is there any tracking Number for my item? Q: Does this product come with retail package? A: We have declared the packing detail on the description of each product, please check it. Thank you! Q: I am a reseller. I would like to buy many pieces of your item, what's the wholesale price? A: Hi, thanks for your inquiry, if you would like to buy large quantity, please send email to us, we will give you the best price,thanks! Copyright ©2019 Cheapest Swiss Watches. All Rights Reserved.